Three years ago, I wrote an unexpected (and posthumous) tribute to Shammi Kapoor, a man who, in dark theatres and small television screens, had laughed and cried and danced and romanced various beautiful heroines across verdant hills and vales. He is the man who turned my wayward heart away from my first love, Amitabh Bachchan. (That was the slippery slope of cinematic infidelity, I'm afraid, since I fell for Raj Kapoor, Dilip Kumar and Dev Anand in quick succession after that. Not to mention Cary Grant, Gregory Peck and James Stewart.) His films were filled with an innocence, a zest for life, and a sense of fun. Whatever else he was, or wasn't, he thoroughly enjoyed being on screen. And that enjoyment seeped out of the screen, both big and small, and infected the audience. He changed the face of the Hindi film hero. He was a winsome brat, a macho rebel, a debonair, and swaggering, lover. When you speak of Shammi Kapoor, music cannot be far behind. 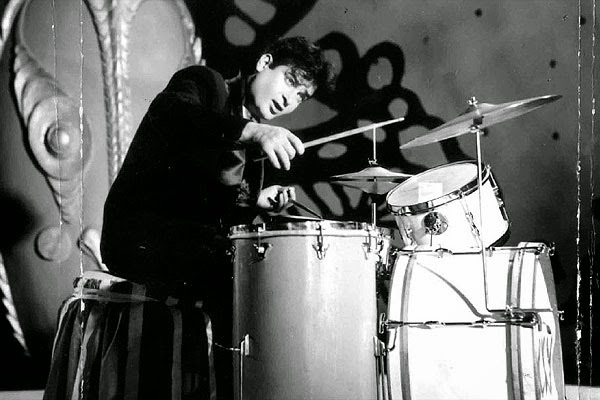 All his films had that in common - melodious songs that were loud and energetic, joyous and boisterous, soft and romantic... Few people know that Shammi Kapoor learnt classical music for five years. His brother, Raj Kapoor, had been learning music for a long time but once he began his film career, his shooting schedules left him no time to continue the lessons. Their mother promptly put Shammi Kapoor in his place, and Shammi became Pandit Jagannath Prasad's pupil. Later, as part of Prithvi Theatres, his music lessons continued. His musical world expanded when he earned a gramophone - in lieu of a kiss. In his Shammi Kapoor Unplugged series, he mentions how, on the sets of Barsaat, Nargis had promised to kiss schoolboy Shammi if he would pray for her. (Nargis was keen on acting in Awara, but her family were against her continued relationship with Raj Kapoor.) By the time Awara rolled around, however, Shammi was a strapping young man, and when she saw him on the sets, she ran away and locked herself in her makeup room. Shammi, full of mischief, insisted on his reward. She offered him anything his heart desired, and the canny youth asked for a gramophone. Nargis promptly put him into her car, drove him to HMV House, and asked him to choose whichever one he wanted. Then, she took him to Rhythm House, and bought him twenty records of his choosing. It was a turning point - from then on, every waking moment was spent immersed in music - Ramba, Samba, Western Classical, Gypsy Music, Jazz... It became an obsession that would be reflected in his films. He worked closely with the music directors and singers and musicians, and often sat in on recordings. He choreographed his own songs, his loose-limbed grace and innate sense of rhythm shaking every canon of 'dance' that Hindi films had hitherto seen on screen. And his obsession with music meant that, quite often, he often had an instrument with him. And I began listing these songs. At the time, it was merely an academic exercise to satisfy my own curiosity - how many instruments did the man play on screen? Songs such as Baar baar dekho and Dil ke jharoke mein were easy choices. But as I continued to listen to his songs, the list began to grow longer and longer, and I began to see the seeds of a post. China Town is a film that had everything - a tight script, wonderful songs, excellent characterisations... there wasn't a wrong note in the film. It starred Shakila, and Helen (in a proper role). And two Shammi Kapoors, hereafter referred to as SK1 and SK2. Mike (SK1) is the suave and arrogant criminal residing in Calcutta's China Town. Shekhar (SK2 with a pencil-thin moustache), is a curly-haired singer who works at a restaurant in Darjeeling while waiting for his big break as a musician. And of course, as a singer and musician, he gets to sling around a guitar. Shakila plays his lady love, and one night, when she is visiting him at the hotel, Shekhar decides to serenade her with an open-declaration of love. Baar baar dekho is interesting because Shammi imbued Shekhar with such effeminacy - limp wrists, delicate head shakes, simpering mannerisms, et al. But oh, for a big man, he still moved with such grace. Now, I had no idea what this instrument was, though I had seen it (on screen) before. So, first, I needed to find out it was. And all hail the kampu-deivam, I found out that it is a 'gopiyantra'. Further digging gave me the information that the Gopiyantra belongs to the Iktara family, and is a very popular folk instrument played by the Bauls of Bengal. It is said to be the oldest string instrument of India. Also known as the 'gopichand', the instrument is made of a drum that is open on top. A bamboo reed that is split almost three-quarters of the way is attached to both sides of the drum (which can be made of gourd, coconut, or hollowed wood). Fastened in between is one metal string that runs through the centre of the drum and is held in place by a piece of leather at the bottom of the drum. Compressing the reeds or pulling it apart allows the pitch to fluctuate. This song situation comes a few scenes after he is shown strumming his guitar in the hotel's restaurant. Now, where he's hidden his guitar, and how he managed to lay his hands on a gopiyantra are questions that the film does not answer. Be that as it may, Shammi has a fine time strumming the instrument and pretending to be a mendicant. Of course, this being SK2 (see above), he manages to get caught. Shammi is Anil, alias Rocky, a musician in a hotel in Mussoorie. He's already run afoul of a very personable young woman, and now here she is, in the hotel. He also knows why she is there - to beat up Rocky, the drummer. In order to save himself, he cons her into believing that his friend (Salim Khan) is Rocky. But he has to sing, of course, because Ruby (Helen) refuses to dance if Rocky doesn't sing. So he pretends that he is singing only to do 'Rocky' a favour - the latter has ostensibly lost his voice. And so begins O haseena zulfonwali, with the fake Rocky playing the drums, and Anil singing, and joining in the interludes with a whole host of instruments. Shammi actually does a good job of matching his playing with the actual sound of the instruments in the background. This song had a plethora of instruments - drums, violins, acoustic guitar amongst others, not limited to the ones that Shammi Kapoor played on screen. 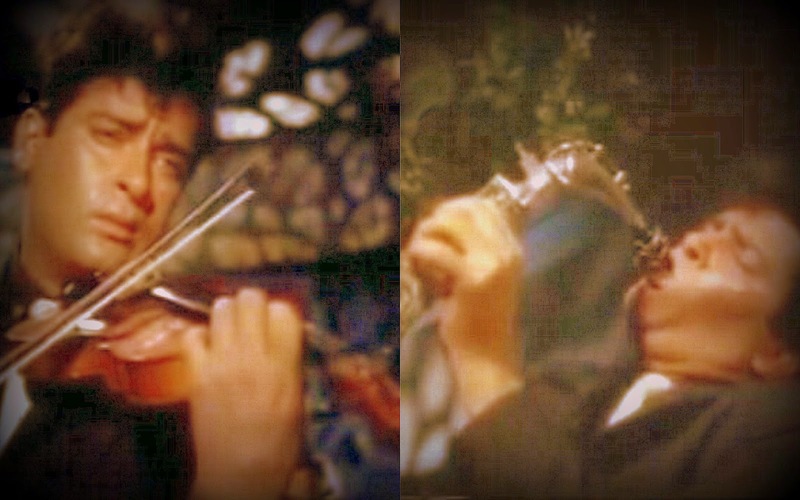 According to RD Burman - The Man, The Music (Anirudha Bhattacharya and Balaji Vittal), around eighty musicians were used for the song - close to forty of them were violins. Musically, this is not one of SJ's best tunes - the antaras are far too repetitive for that, and I find the orchestration too rich and overwhelming. But Mohammed Rafi has sung it beautifully, Shammi emotes well, half grieving, half cynical, the picturisation is superb, and you have to watch it as contextual song to really appreciate it. (I must confess that I used to like this a lot more when I was younger.) This is one of the songs where he is playing the instrument right through. Funnily enough, when they show a close up of him playing the piano, he actually looks like he is pressing the right keys; but when they show him from the front, he looks like he's waving his arms around for no particular reason. Now, this is my favourite song from the film. I fell in love with an effervescent Shammi shimmying as only he could, and with a young and beautiful Mumu sashaying on screen in a tight orange 'sari'. I can well imagine that this song must have been a craze when the film was first released. It is the polar opposite of the pathos-laden Dil ke jharoke mein that comes much later in the film. Rafi's voice ebbs and soars, and one can almost imagine him dancing as well as singing - you can hear the same joy in his voice that Shammi enacts onscreen. Shammi begins the song with a turn on the piano accordion, and then, towards the end, executes a riff on the piano as well. In between, he jumped, he twirled, he fell to his knees, he matched Mumtaz step-for-step and between them, they gave us a song that was as much a joy to watch as it was to hear Rafi and Suman Kalyanpur sing it. Trivia time: According to Mumtaz (an interview with the Times of India), she was madly in love with Shammi Kapoor during the making of this film. In fact, Shammi proposed to her, but she was only 18 at the time; he wanted her to give up films, she refused. Even more interestingly, this song was apparently composed for a Nasir Hussain film starring Dev Anand. (I wonder which one.) Dev Anand rejected it, and it was used with great effect in Brahmachari. Dil Deke Dekho, coming soon after Tumsa Nahin Dekha, consolidated Shammi Kapoor's position as the rebel star. Once again, Shammi is a musician (he played that role quite a few times in his career), and here, instead of a guitar or a piano, he has the drums. Dil Deke Dekho had lovely songs, though one was a straight lift (Dilruba meri Neeta was a blatant copy of Paul Anke's Diana) and the title song Dil deke dekho was 'inspired' from Sugar in the morning by the McGuire sisters. Rafi sings it with the verve and enthusiasm that a 'Shammi Kapoor song' deserved. As Shammi often said, Rafi always added an 'extra something' when he sang for Shammi Kapoor. 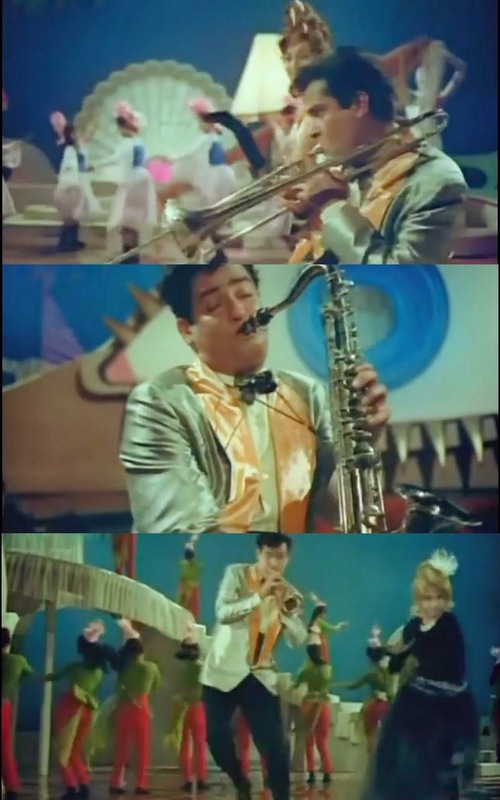 Unlike Bolo bolo from the same film where Shammi Kapoor only plays the prelude to the song, and then gets up to dance, here, he stays put for the whole song. He's the only hero I know who looks like he's dancing even when he's sitting down. In fact, I'm surprised he could bear to sit down for that length of time. There's an inherent air of barely leashed power in the man. This is not a Shammi Kapoor song, actually. In fact, he doesn't even appear until after the song is done. A musician in a nightclub, he is found guilty of a murder that he had not committed, and confined to a mental asylum because his lawyer pleads insanity as his defence. When he comes back a year later, it is to find his beloved married to his best friend. Hurt and betrayed, he wishes them well, and then, his emotions overflow in music as he plays first the violin, then the saxophone, and finishes off with a rousing finale on the piano - just as he truly loses his mind. Watch him when he is playing the sax - you can almost believe that he is playing it himself, each breath that he takes synchronising with the way the notes are actually played. This is a film I would dearly love to watch again; I watched it in bits and pieces with no songs at all. So it was wonderful when I came across this song. Not only because it had Shammi play (or pretend-play) the harmonium and the mandolin, but because the sequence itself is such fun. Now, not having watched this in the context of the film, I have no clue when this appears in the film. But Nath (Shammi) is trying his best to impress Vimala (Nalini Jaywant). He is a theatre manager, she is hoping to be the lead actress. But since he cannot sing or play any instrument, his assistant manager (Ram Avatar) is doing both from behind the door, and later, from under and behind stage props. So Nath begins by pretending to play the harmonium when he realises that the instrument being played is actually a mandolin. And he lip-syncs to the song. Of course, Vimala is rather smart and realises that song is coming from behind the tree-trunk that is hopping about her, and later, the stuffed bear she is sitting on. But Nath continues to strum the mandolin with abandon. Bluffmaster may not have been a great film, but like most of Shammi's films, it were watchable. And equally certainly, like all of Shammi's films, they had decent songs. (No, not 'great', but definitely pleasant enough.) For a change, instead of a guitar or a piano or another western instrument, Shammi gets down to the basics - a simple ravanahatha, that he poaches off an itinerant seller of these musical instruments (while Saira makes off with her entire basket) to serenade Saira. Vintage Shammi, with Rafi (as usual) providing vocal support. Lata joins in on Saira's behalf, and we have a lilting melody which ends with Pran being made to look like a fool. (What's new, you ask?) The ravanahatha interlude is rather short, but Shammi manages to infuse even that with grace. *I learnt the name of this instrument from Dustedoff's post on stringed instruments. The song begins with a musical interlude, and then Shammi proceeds to 'play' the mouth organ. ('Play' in quotes because while the song does begin with a mouth organ interlude, Shammi is not shown playing it then. By the time Shammi is shown playing the instrument, there are a host of other musical instruments joining in.) But he does play the harmonica like he knows how to. (Unlike Amitabh in Sholay.) However, I would advise anybody watching the film not to drive (or not drive) a car the way Shammi did. Apart from having the car begin going down the slope on its own while he danced by its side, he also swerves from side to side while playing the harmonica. Someone forgot to warn him that driving with one hand while traversing mountain roads is a recipe for disaster. This was another instrument that I had trouble identifying. While I had heard of the 'swarmandal', I had never seen one, and indeed, had no clue what it looked like. So you can imagine how tough it was to find out what the instrument in the scene was! Once I identified the instrument, Wikipedia informed me that it was the Indian zither, and that it was used quite extensively in Hindustani classical music. Apparently, legendary artistes like Pandit Jasraj, Kishori Amonkar and Ustad Bade Ghulam Ali Khan have used it extensively. Shammi Kapoor has certainly increased my knowledge today! Unfortunately, this film came along when Rajesh Khanna had already been ushered in on a tidal wave of change; Shammi's expanding girth was not helping either. Paired with a much younger Leena Chandravarkar, this was one of the films whose box-office success, or lack thereof, made Shammi realise that it was better to quit playing 'hero'. But in any case, failure or not, the film gave me the opportunity to see Shammi Kapoor in disguise, pretending to be a musician, and handling the swarmandal quite competently. Instead of Mohammed Rafi, he has Manna Dey providing playback. Trained as he was in classical music, it was easy enough for Shammi to portray a classical musician with a certain amount of verisimilitude. He does rather a good job with the adas and harkats that Manna Dey conveyed with his voice, all the while strumming the swarmandal with almost unconscious ease. Nine films, eleven songs. And there are other songs where he played instruments for a short while - like the traditional drum in Govinda aala re (Bluff Master) or the harmonium in Socha tha pyar hum na karenge in the same film. The whole series, Shammi Kapoor Unplugged, is an interesting window into the life of the man who strode flamboyantly into the cinematic arena, and lived life king size. He narrates his reminiscences with such charm (and roguishness) that it is impossible not to smile, if not laugh outright at the episodes. If you have the time, do go through the series. They are each about 5-6 minutes long. I guarantee they will chase away the blues. Have you seen him play any other instrument? In which song, or scene? Feel free to add to this list in the comments. Excellent write up Anu, enjoyed it so much. A few years back, I stumbled across his Shammi Kapoor Unplugged, and it became our ( my husband's and mine) daily nightly dose. We came to know Shammi Kapoor the person and as much as we liked Shammi Kapoor the actor, we liked him as a person even more. You know he never had anything negative to say about anyone. Just when we felt that he had become our nightly friend, he passed away. Years ago a neighbor and a friend ( American ) called me one Sunday morning to ask if I was watching a local channel that broadcasted indian program, I said no.. "Oh turn it on" she wanted to know who the handsome actor was - well, the song was almost over but it was Shammi Kapoor ! So I rented a VHS of Shammi Kapoor songs for her, she just loved him ! I had heard "Cham Cham baje re" but never checked out the video. So it is Shammi Kapoor ! Surmandal is still in use by many classical singers. Pandit Channulal Mishra of Banaras uses it extensively. Hum Sab Chor hain was one FUN movie to watch, full of crazy characters. I specially liked Shammi Kapoor's sentences beginning with " o balle o balle " and Nalini Jaywant is such a comic and natural. Really enjoyed your post ! Great choice of songs ! Delightful post, Anu! Ever since you mentioned this to me on e-mail, I've been waiting for you to publish it. Well worth the wait. Thank you so much. Yes, some of the songs here aren't particular favourites of mine, but as a listing of songs which show Shammi at various musical instruments - it's very comprehensive. That swarmandal thing was completely new to me (also because I've not seen Jaane Anjaane, and wasn't familiar with that song). I can't think of any songs right now that I could add to your list, but I have a feeling Shammi Kapoor's character in Tumsa Nahin Dekha wandered around with a harmonica. Thank you for the appreciation, Madhu. As I mentioned last month, I'd sat on this post long enough. I agree with you about the songs in this post - I'm not too fond of some of the songs myself. (I wager they are the same songs you do not like. *grin*) But since the subject of the post was to show him playing different instruments, it didn't matter very much. Coming a little late into this post but then I just recently discovered your blog ! So first things first, your husband is a fabulous writer or poet for that matter. Hats off to him for such a "karara jawab". My compliments ! As to the other lady ( should I even call her that ) less said the better ! Yes, as for the original article, uff! The things that are published these days! I saw "<I Hum sub chor hain" years ago on VHS and tried to refresh my memory, but as you said the you tube version is choppy... Very choppy. Your review was funny in spite of it and from bollyviewer 's remarks, the VCD copy is not that much better. Oh how I wish they would preserve our old movies. Indeed a very deserving recognition to Shammi Kapoor, the actor. What an interesting topic and the links to Shammi Kapoor unplugged priceless! I wish had the time to go through the episodes, any way maybe sometime in the future. Keep up the good work, most of us often do not have the time to surf the net, such links are really welcome. We just got back from a trip last night and I found that you and Madhu have been very active in my absence, so I have a lot of reading to catch up now! Love these songs and admire the research you have put into this post - wonderful, wonderful, wonderful! But first I have to do the mundane stuff of life, like laundry, and figuring out something for lunch, and then I plan to spend the afternoon drooling over this. Thanks, Anu, for this musical post! Whatever happened to my comment ? Oh I know, I was trying that whatchamacallit the italics :) I must have used the " do not display " tag :) anyways, I was trying to say that watched hum sab chor hain years ago on VHS, it wasn't choppy and wish our film companies would do something to preserve our old movies. And the blog lives on..... Many more to come Anu ! I really liked your choice of photographs, giving a glimpse of the two singers involved. I could not resist adding 3 songs, maybe they are there, I did go through the comments, if I overlooked, then your readers and yourself forgive me for being redundant. Vyjayanthimala is so good in this dance. 2. Pyar par bas to nahiin hai - Talat and Asha from Sone ki chidiya - I like both , though Talat's a tad bit more. 3. Jyoti Kalash chalke - Lata and the music director Sudhir Phadke . Here is the link, you decide. Thank you, Shilpi. The Shammi Unplugged series is really really interesting. And so much fun also - he is very humorous. Thank you, Lalitha. I hope you finished your laundry and cooking etc., (You mean this didn't tempt you to put all that aside and read this. *grin*) and drooled. :) Shammi is definitely worth drooling over. I was wondering whether there was more to the comment than was actually published. Half our films are better watched on VHS. I wish the DVD manufacturers would use those to make their master prints. I agree with you - I wish the industry as a whole would do something to preserve our cinematic heritage. You really are going through my blog bit by bit! Thank you so much, Neeru. This makes me very happy! I definitely prefer the male versions in the first two songs. With Jyoti kalash chhalke, I am conflicted. I liked Sudhir Phadke's version a lot! ; I hadn't heard Sudhir Phadke's version before, so a double thank you for that. But Lata's version, I think, will always remain the seminal version for me. Actually, I did go through a couple of songs and then put in the laundry! How could I not do that, when Shammi was singing and dancing away? Since I had never heard the 'bala jogi' song before, as well as the one from Hum Sab Chor Hain, I had to listen to them first, so I did, and then did the laundry and cooked some rice. Yes, I listened, and I drooled! Now to listen to the other songs after doing the dishes! You know, listening to Lata's Jyoti Kalash is like the hairdo with every hair in place and beautiful, with Sudhir Phadke's it has a flair... if he sang again in another gathering, it would sound a bit different, and still wonderful. It gave me peace when I first heard it. Oops, my reply went in the wrong slot. But yes, I am enjoying your blogs, I hope you don't mind my commenting on the old ones. I liked your analogy. I think it hits the spot - Lata's version is pure, almost impossibly perfect, not a syllable or emotion out of tune. Sudhir Phadke's rendition was infused with emotion alright, and I loved his voice (this is the first time I've heard him singing), and wonderful in a completely different way. Hi Anuradha, I am a portrait artist. I would like you to go through my works on my blog- www.heartatart.blogspot.com As a personality connected so closely to films, I have a feeling you may find it interesting. Hi Saurabh, welcome to my blog. I did go over to your blog and yes, it is very interesting. I will visit again. I really liked this post ... I've already read it a few times :D Also, agreed that Shammi's actually voice still had good pitch and tone--wish there was more of it, as you also expressed. You know, altho I don't find him attractive personally, he's such a charismatic figure--with so many real talents--I can't help but take an interest. In fact, it's more my interest in him as a person that has led me to his films, so far. Actually, tho I feel he's remembered for all the high energy stunts, my favorite Shammi is when he slows down and shows you this little things he's mastered ... such as Urdu recitation. Clearly, that wasn't the only trick he had up his sleeve, if this post is anything to go by! Thank you very much for reading it more than once. :) You make my day. I really did enjoy him when he became sober and subtle and romantic. Goosepimple territory, that. And yes, he could sing, couldn't he? This is such an amazing post! Shammi Kapoor is the only actor I have "fan-girled" over! Okay, some of the songs on this list are not my favourites ... But then they have Shammi... enough for me to drool :-) Oh boy, I was not aware of the Shammi Unplugged series! how could i have missed this? Thank you for the links! Yeah, some of the songs on the list aren't my favourites either, but as I was mentioning to Dustedoff, the post was more about Shammi playing different instruments than about the songs itself. You must, must watch Shammi Kapoor Unplugged! It's absolutely fantastic - he comes across as such a genuinely warm person, and th episode when he talks about Geeta Bali is so poignant - you can tell he loved her very much! Do watch.